The first recognisable body of paid, uniformed police officers evolved out of the River Thames Watchmen employed to deter thieves operating along London’s riverbank. The Thames River Police was formed in 1798. The first mention of the railway police was in 1825 when the Stockton & Darlington Railway Company employed Police Constables. Three years later the Metropolitan Police came into being to maintain law and order in the capital. This was quickly followed by Acts of Parliament catering for Borough Police forces to be formed in towns and cities and then County Police forces. This was the era of the industrial revolution. 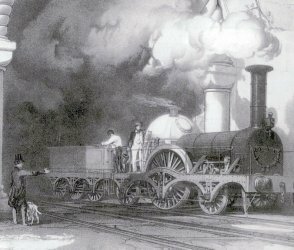 Railways were rapidly expanding right across the country, steamships were taking to the seas and new docks were being dug to accommodate them. This new found growth attracted men from all over the world. Gangs of navvies were employed in building these great works and lawlessness abounded. It was no coincidence that the police service emerged during this same period. Most railway companies and many new docks employed Police Constables not only to maintain law and order but also to regulate the movement of trains. Train technology was in its infancy and accidents were commonplace. One early case involved Liverpool MP William Huskisson who was knocked down and killed during the official opening of the Liverpool to Manchester railway in 1830. Railway policemen therefore, were used to prevent accidents. They were responsible for operating the signals and in those early days were often referred to as Switchmen or Pointsmen. They can be likened to officers in Borough and County forces who performed point duty at busy road junctions, often operating traffic light signals. Responsibility for train safety was taken very seriously, and several Constables were prosecuted for failing in that duty. In 1858 Railway Constable Thomas Venn was prosecuted for failing to prevent a collision and was fined forty shillings (two pounds) plus costs or 14 days imprisonment. When the time came that railway companies employed their own signalmen separate from the police, the nickname ‘Bobbies’ transferred across as well. Railway signalmen were commonly called Bobbies right up until signal boxes were phased out in the late 20th century. but they were not just railway owning companies. The GWR for example, inherited all of the South Wales ports and at a stroke became the biggest dock owning company in the world. Each of these companies maintained significant police forces, including many officers serving at the docks. In 1948, these four railway companies were themselves amalgamated to become British Railways. Together they joined the nationalised docks, the cross channel railway steam ships, railway hotels, London Underground, London Buses, the canals and waterways and for a short period, British Road Services, the nationalised road haulage business. This giant consortium became known as the British Transport Commission. As a result, the country’s first national police force, the British Transport Commission Police, was set up to serve the whole of this transport network. It was at that time, a force of some 5,000 officers. The Commission itself was short lived and was dissolved in 1963 after some of the smaller undertakings had gone their own way. Control of the docks was taken over by the British Transport Docks Board (BTDB); and so the force changed its name for the last time to become the British Transport Police. Twenty years later, the British Transport Docks Board became one of the first publicly owned organisations to be put into the private sector to become Associated British Ports (ABP). One of its earliest decisions was to dispense with the services of the British Transport Police at all of its nineteen ports nationwide and five other passenger ports followed soon afterwards. The last officers were withdrawn from the ABP docks in April 1985. Today, the British Transport Police is a highly organised, well trained, modern and respected force. Its aim is to help build a safer railway environment that is free from disruption and the fear of crime. The role of the force has been reviewed many times over recent decades and each time it has received a mandate to continue its vital role in protecting the railway community. It is also in the forefront of the fight against terrorism. The force we know today did not simply fall from the skies. It evolved from its early roots and continued to improve in efficiency and organisation through the years. In many respects it has always been at the forefront of policing. The railway police were the first force in the country to use trained police dogs (1908), one of the first to use drug sniffer dogs (1974), and the first to introduce a computerised crime reporting procedure (1970s). The force took a national lead in football intelligence in the 1980s, and developed a bomb threat analysis procedure, later adopted nationally, as a result of dealing with twenty high explosive devices, forty incendiary devices and more than five thousand bomb threats during one three year period (1991-94). The British Transport Police has a rich and varied history and it is the aim of this group not just to preserve that history but to inform communities of the future about the role it has played in the past.